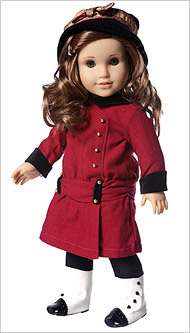 Just Call Me Chaviva: Finally, a Jewish American Girl Doll! I spent years ooing and awing over the American Girl catalogs that were diligently delivered to my house as a child. I wanted the dolls, the clothes, the accessories -- but all I got were the American Girl playing cards, which I purchased with meager birthday earnings at Silver Dollar City, a "resort"-type place in Branson, Missouri, where people dressed up in old clothing and pretended to rob train passengers. Those were the days. But who would have thought that all of these years later, after they introduced Addy, the African American American Girl doll to much applause and cheering, that they would finally come around and introduce a Jewish American Girl Doll. So far, there has been an (American) Indian, a Latino and an African-American, but so far no Jewish or Arab or Asian (are those PC terms?). Now, however, you can get your very own Jewish American Girl doll, with a story line and all! Her name is Rebecca Rubin, a 9-year-old girl living on the Lower East Side in 1914 with her Russian-Jewish immigrant family, including a grandmother known lovingly as "Bubbie." Here's some more from The New York Times article. Feel free to donate some cash-money to me so I can finally get an American Girl doll. I've always wanted one, and now I can have one who represents, well, I'm not sure what she'd represent, but I want it! Perhaps the most amusing line from the article, though? But seriously, I want one of these puppies! Mostly so I can buy all the awesome Jewish accessories. Her release date? May 31. Start your buying engines! Hat tip to @JewishTweets for making this mention to the world.